I first met Kresse Wesling back in 2008 when I ‘won’ her as a mentor. We are around the same age but she had already won numerous awards for the social enterprises she had founded. I hadn’t even started my first business and was, to say the least, a little in awe. Kresse’s vision, determination and total commitment to seeking out sustainable solutions was, and still is, inspiring. 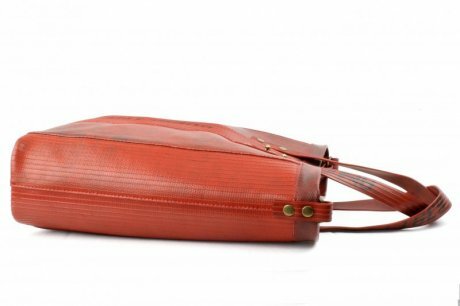 By then Kresse had co-founded Elvis & Kresse, a brand that has now become synonymous with sustainable luxury. A chance meeting with some firemen in 2005 and a subsequent discovery that 10 tonnes of fire-hose was going into landfill each year in London alone, was the catalyst – give Kresse a ‘waste’ problem and she will find the answer. Reading the WWF Deeper Luxury report further inspired her to find a way to upcycle this ‘rubbish’ into something high-end and fit for (Hollywood) royalty – among other stylish celebrity fans, Cameron Diaz graced the pages of US Vogue in 2009 wearing a fire-hose belt. When a fire-hose is damaged beyond repair, the whole hose is decommissioned and cannot be recycled. But, the fire brigade’s loss is our gain. The hose has a unique texture and handle, and is extremely durable (I can vouch for this – I fell over on the ice and when my classic fire-hose tote broke my fall, there were no scratches to be seen), all of which make it a great alternative to leather. In addition to the traditional red hue, fire-hoses are also made in yellow, blue and the very rare black which create further design opportunities and limited editions such as the vintage-inspired Bowling Bag. It’s not just famous faces who are fans of the humble hose - over the years other brands have cottoned on to the charms of this special material. Earlier this year Elvis & Kresse collaborated on a range of accessories with Arthur & Henry who we featured here last week, and most recently the iconic British designer Bill Amberg, with whom they have just launched the "Tooley Tote" bag. 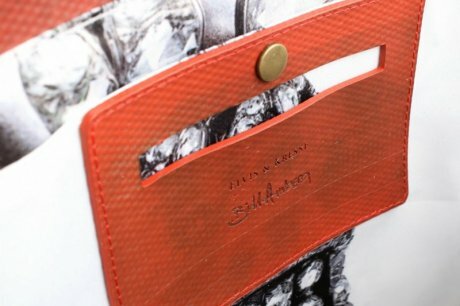 The two brands worked together over five months to ‘re-engineer’ one of the classic Bill Amberg’ totes, using the fire-hose (it is not a straight-forward material to work with – back in 2005, it took Kresse and partner Elvis months of experimenting to figure out how best to manipulate and re-purpose it). I am pleased to say that none of this celebrity endorsement has changed Elvis & Kresse - they still scrub and clean the hose themselves by hand (around 10 tonnes of it each year) and are somehow finding time to upcycle various found or discarded materials into furniture for their new home. Before its reincarnation as a bag, belt, phone case or cufflinks, the fire-hose has already served up to 25 years of active duty fighting fire and saving lives. 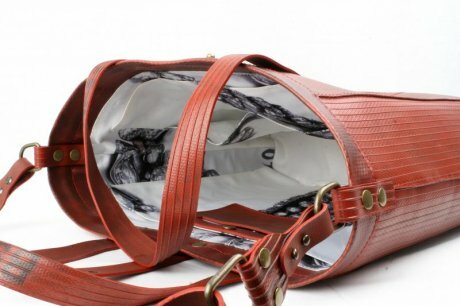 To date Elvis & Kresse have ‘saved’ around 70 tonnes of fire-hose from landfill and provided me and 1000s of others with beautifully conceived accessories – each has a story to tell and at least one more life to live. The Tooley tote will be available in stores and online in November 2013 priced £260.